Day by day the anti-Israel alliance, and sadly in collaboration with major church movements mainly from the historical Protestant world, is seeking to make the Apartheid State accusation leveled at Israel stick. There is more to this than meets the eye in that the real intention behind labeling Israel an Apartheid State is to remove altogether the Jewish State. The Apartheid State of South Africa was rightfully dismantled in the late nineteen eighties and early nineties. It was first discredited, then delegitimized and finally dismantled to the joy of the world and the enslaved black majority who had lived under and endured its brutality. However, to describe Israel in these terms is, quite frankly, immoral and wicked and yet on the university campuses of the Western World this is becoming the popular thing to do. Radical leftist academics and politicians are teaming up with Islamic elements to pursue this goal. They want to equate Israel with the original apartheid state and thus demand that the world do as it did to South Africa; dismantle it! Most of these people know absolutely nothing about Apartheid but the word is extremely powerful since it conjures up notions of hatred, discrimination, brutality, racism and prejudice. It is quite astonishing to witness how a lie told often enough can eventually be accepted as truth! Most of these people have no knowledge of the “inner workings” of the apartheid regime and couldn’t even tell you the basic facts about it. It’s just a very powerful weapon to use when discharging their hatred of Israel. Essentially apartheid was a totalitarian system of governance, not unlike those of the Arab world today, where a minority population subjugated and enslaved the overwhelmingly black population. It was ideologically driven and was obsessed with racial superiority. The superior white population could not mingle with or even sit on a bench with the inferior black peoples. Even the education system was “dumbed down” for black people because they were mentally inferior and could not cope with the high levels of learning that whites could embrace. The towns and cities were “white by night” as all “blacks”, as they were called, had to be removed to their shanty towns that served as cheap labour ghettos for the nation. The black people could not vote, own property or even move freely in their own country. There is absolutely nothing equivalent to this in the dispute that rages between the Palestinians and Israel today. Arabs, Jews, Christians and Palestinians share the same shopping malls, benches, hospitals, theatres, and in many cases, suburbs. The educational institutions do not have a “dumbed down” Arab/Palestinian curriculum and the privilege of voting is given to all. Israel has Arab Members of Knesset and Jews, Arabs and Palestinians often work together on construction sites, in businesses and in hotels etc. Most important of all is the fact that Israel is a democratic state, (not a perfect one), with democratic institutions and is not governed by a totalitarian minority! It is also important to remember that there never was a Palestinian State in the region as even Jews were called, and registered as, Palestinian in 1948! The British government held mandate over the country and accepted the right of Jews to have a state of their own in what was their ancient homeland. Even the United Nations accepted and voted for this right. When Israel implemented this decision by declaring its existence she was immediately attacked by no less than five Arab countries! This brings into focus the real nature of this conflict. That is, it has very little to do with politics or peace agreements but everything to do with theology! By this I mean a radical jihadist theology that considers the whole land of Israel and not just the West Bank part of the house of Islam. This theology dictates that all this land must be returned to this house by peaceful, political or violent jihad. So, when the Palestinians had everything they say they want now from 1948 to 1967 they neither protested against the illegal Jordanian occupation of the region nor even remotely demanded a state of their own. They did however found the PLO in 1964 charged with the distinct mandate of destroying the State of Israel. They subsequently launched a terror campaign to prove it and throughout the Oslo peace initiative era refused to remove the infamous “destruction clauses” from their charter! The same jihadist theology drives Hamas, the Alaksa Brigade, Hezbollah, Ahmadinejad of Iran and all the rest. This has absolutely nothing to do with Apartheid! The state of Israel enjoys a Jewish majority; it is democratic and has demonstrated a willingness to make painful concessions in order to make peace with its neighbors. In all cases it alone paid the real price by giving up land. It even withdrew from Gaza to demonstrate its sincerity in seeking a peaceful resolution to the conflict with the Palestinians. The trauma that the withdrawal brought to the people of Gaza and the wider nation was played out for the entire world to see on the international media. It was not good enough! So, the result was the, “same old, same old”. That is, within a short space of time ten thousand missiles, fired from the vacated territory, rained down on Israel’s civilians in the southern part of the nation. The world said and did very little but Israel is, of course, an apartheid state! Over the years, and in response to one of the most ambitious peace initiatives in Israel’s short history called Oslo 1, 2, and 3, the Palestinians have opted for violence. This is called “Intifada.” Wave upon wave of suicide bombers attacked Israel from the porous boundary line between the nation and the West Bank. Men, women and children were indiscriminately murdered in buses, restaurants, hotels and shopping malls. To protect herself from these murdering intruders Israel built a barrier fence, which, in some more dangerous areas, becomes a wall. It is not built to segregate people or discriminate against them but to protect its citizens from attack. In this connection it has been highly successful though even Israel admits that it is regrettable. But, what would any other self respecting democratic state do? Nevertheless, the Apartheid accusers love to use the wall to further their accusation. To presume, after all that Israel has been through in her sixty-two years of statehood, that Israel has no legitimate security concerns is madness. The Palestinians have time and again demonstrated that their strategy has not changed since 1964. In Johannesburg in 1994, after shaking the hand of Yitzhak Rabin on the lawns of the White House near the end of 1993, Yasser Arafat declared as much. Palestinian Media Watch has also repeatedly drawn attention to this fact. The liberal left and their fellow travelers conveniently ignore this fact. No sir, Apartheid is not the issue, the destruction of Israel is. Just this past week, the Syrian based Hamas leader stood shoulder to shoulder with Ahmadinejad of Iran and together they boasted that very soon Israel, in its entirety, would vanish from the map of the world. Theirs is a holy war but for the liberal left it is Apartheid and the truth is their radical positions have made them allies! This same radical left group espouse democracy but in practice denies it. They will not allow Israeli academics, leaders or politicians to exercise their democratic right to free speech. Their intolerance knows no boundaries as they threaten and trash meetings in educational institutions in western countries that supposedly are there to educate within the context of democratic values. This is exactly what the apartheid thugs of the South African regime did. They violently brought public meetings to an end if anyone opposed their view of the world. They were scared to death that someone might just have a more truthful and compelling argument to theirs. The democratic rights they claim for themselves they deny others. For sure the Palestinians have suffered and still do but to place the blame entirely at Israel’s door for this is folly. Their failed and corrupt leadership, missed opportunities and willingness to support conflict is also a crucial component in their suffering. Israel is no Apartheid state. She is a democratic state living under the constant threat of annihilation and thus seeking to balance her need to find a lasting peace with her neighbors with that of her security. Her regional experience has taught her that her security and very existence is the number one issue. After all, in all the so called peace plans presented to the region, she is expected to do all the giving with only verbal guarantees of security given by her interlockers. These have never amounted to much! 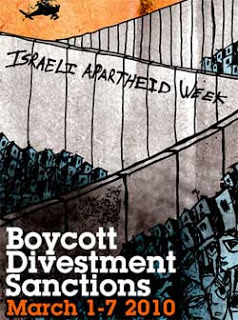 The truth is the Apartheid accusation is just another smokescreen in the war against Israel! I should know it because I grew up in Apartheid South Africa. For more on the life and struggle of Malcolm against Apartheid, read this article from Jerusalem Post Christian Edition entitled “Still Fighting Apartheid ” by Lela Gilbert.